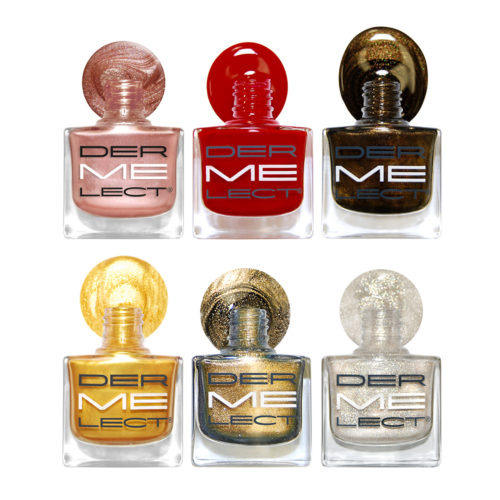 Featuring six holiday-hued polishes, the Dermelect 2018 ‘ME’ Holiday Lacquer Collection is infused with protein-peptide technology. Boasting rose gold tones, shiny silver metallics and a festive fiery red, this nutrient-packed collection is sure make your holiday season sparkle! Dermelect commits to healthier nails. All six lacquers—Halo Chrome Rose Gold Magmatized Fiery Red, Decadence Metallic Espresso, Nobody’s Fool Chrome Marigold, Gilded Textured Patina and Sleigh ‘ME’ Arctic Shimmer—are formulated to strengthen weak, brittle nails and restore flexibility. These richly pigmented hues are formulated free of DBP, toluene and formaldehyde, while still extending your chip- and split-free polish-wear. So whether you’re staying cozy by the fire with a cup of joe or slipping into your favorite holiday dress for a night on the town, there’s a seasonal shade for every occasion.